Hi everyone, it is me and we are back from our boating holiday on the Norfolk Broads. Did we have a nice time? Yeah it was good, mixed weather from lovely beach sunshine to shocking rain that meant we couldn't see where we were driving our boat but it was all very character building which is what I think holidays are all about. Happy memories for us all. Big Sis had a watch from Father Christmas but she did not wear it much because the strap was too long and then became uncomfortable when we wrapped it round her tiny wrists more. So I made an elasticated one which has turned out to be brilliant. I saw it on a blog called Pretty by Hand and made one similar. Click the link for a tutorial. She said after the first day of wearing it, "it is so comfy I forgot I had it on." This was great news because she was actually telling the time on holiday which is why Father Christmas bought it for her in the first place. More crafty holiday news, we visited Norwich Cathedral and they had the most fabulous weaving and textiles exhibition on. There were some gorgeous knitted, crocheted and woven articles exhibited in the entrance hall. A lovely lady let Big Sis have a go and gave the girls her sample cards for weaving on and some yarn to take back to the boat. Good job, it rained solidly the next day and they passed the time watching a DVD and weaving! Finally, I would like to show you the beautiful cardigan my mum knit for Big Sis for her holidays. It is made from Patons Favorito from black sheep wools online. The pattern is from the Sirdar Haylofter collection and it has been a total hit on all fronts. No bobbling even after washing, a soft cotton/chenille feel that is not itchy and that cabling is something else. So thanks for tuning in, I am pretty busy this next week with holiday washing, the allotment weeds, a job interview, crochet classes, tutoring and all the other carnage that makes up my life but there is always time to catch up on your blogs too. This month I have made a summer wrap from my Minerva products. The kit contains yarn, hook and pattern. A lovely daisy/granny pattern that once set is easy to follow. 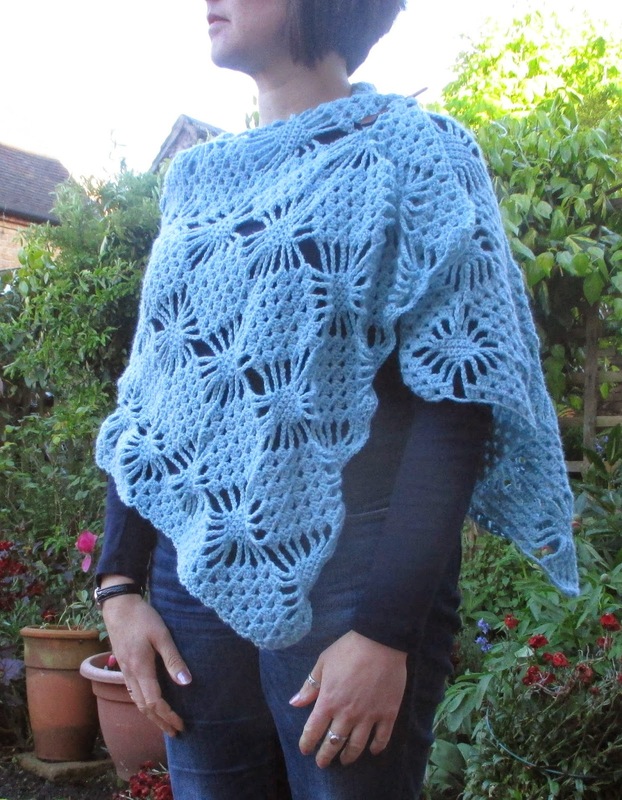 You will need Five balls of Sirdar Click DK to make this wrap. As a guide, I did a pattern repeat of grannys/daisies a night so it took me about 12-14 nights to make it. The kit contains the yarn pattern and hook. I chose the wrap but I could be giving the other one a go soon. (I have some Noro leftover and you know I don't like to hoard stash). Summer is here, some days, but with the UK's unpredictable weather we will always need a pretty cover up. We leave today for a week on the Norfolk broads in a boat with my wrap to keep off the chill. Might just pop a waterproof in too! See you in a week. My dress for the Minerva meet up. I hit a stumbling block but Louise from There she Sews came round on Monday and sorted out the armpit gussets! I know, did you know they even exist - she did, which is why she is a great sewing friend to have. A purchase of a new box to put my sewing patterns in. It is empty and the patterns are still all over the house, on bookcases, in drawers, under beds and behind the sofa. Nice box though. We are going away next week and I have started packing or at least hiding clothes in the spare room to stop the girls from wearing them. What have they been wearing this week I wonder? I have been trying to start the Miette cardigan to take as my holiday project but I have unpicked it three times and resorted to my mother reading out the instructions as I knit it - now that is what I call a knit-a-long! Then she left me with it all perfect and I cocked it up on the following evening. So I have unpicked(each stitch) back to row 10, made a note on the pattern where I am and stuffed it under the sofa. So what does a girl do craft wise? Crack on with my summer cotton pullover? This has been frogged once because it would have fit Pavarotti if I had carried on with the hook and size choice I made - tension square Duh! There is all this sort of 'stuff' (nearly swore then) to sort out as each meal passes. I dropped my beautiful lemon squeezer jug. Grr! Children, picking up, washing blah! blah! And finally a very neglected wild flower jug which I keep looking at every time I walk in through the door. I must move that hairband, drinking straw wand handcrafted by one of my own and the dying flowers. So on the cusp of greatness I would surmise but not quite there today. How is your week going folks? My neighbour gave me a bag of OLD candle ends and candles that would not burn or had lost the wick - you know because that is what people do to me. "You could do something with these Jo," they say. The girls and I set to work making cabin candles in OLD jam jars. They measured the wicks and threaded on a little base to weigh it down, we secured the wick with a felt pen to keep it central. We melted the candles in an OLD metal bowl on the gas ring. Then sifted out any debris - OLD wick ends, labels, matches etc. with an OLD soup spoon. They stood in cold water for two hours and there you are, four NEW cabin candles and a science lesson for inquiring minds. What to do next? make four more with purple wax ends of course. This is a slightly niche post in that for it to be of any interest to you, you need to be a tribal belly dancer and be able to crochet! It is really for the 'Severn Sisters' ladies who asked me to put together a pattern for a Tribal belly dance belt. Chain 4, join with a slip stitch in the first chain to form a circle. Chain 3, 4tr into the ring, chain 3, 5tr into the ring, chain 3, 5tr into the ring, ch3, join with a slip stitch in the top of the first ch3. Join a new colour in a corner, Chain 3, 1 treble in the same corner, do 1 treble in each of the side stitches below 7 times. Make a corner 2tr, 3ch, 2tr all in the corner space. (this combo will be referred to as 'corner' in the rest of the pattern, there is no cue!) Treble 7 stitches along the side, corner, treble 7 stitches along the side, 2tr, 3ch join to first ch3. Join the next colour, in a corner, Chain 3, 1 treble in the same corner, do 1 treble in the side stitches below 10 times. Make a corner 2tr, 3ch, 2tr all in the corner. Treble in 10 stitches along the side, corner, treble in 10 stitches along the side, 2tr, 3ch join to first ch3. For the final round join on black in a corner. Chain 3, 2 treble in the same corner, do 1 treble in the side stitches below 12 times. Make a corner 3tr, 3ch, 3tr all in the corner. Treble in 12 stitches along the side, corner, treble in 12 stitches along the side, 3tr, 3ch join to first ch3. Note: On the final round, the corners have clusters of 3 trebles in them instead of 2 to make it sit nice and flat. Got that? Now make five triangles. Chain 50 in black to make the tie, double crochet on the first triangle, chain 5, dc on the next triangle etc... chain 50 for the other end of the tie. I crocheted 5 rows for the belt doing 1dc in each stitch and 2 chains at each end to turn my work. Add tassels, bells, cowri shells, coins or anything tribal-esque to fit your tribe. Don't panic Annie, this one is yours! Good Luck to the rest of you. Any problems let me know. Hello! Today I am sharing a flower coaster pattern with you. I won a giveaway a while back from Sweetpea family and included in my little parcel was this flower coaster. Now I know everyone has gone a bit crazy for the Mandala at the moment but they don't really float my boat (yet!) but useful coasters to save my great, great-aunts dining table from coffee rings at crochet classes seemed like a good idea to me. I dipped into my organised-stash-zip-bags, (just too dull to show you, but I do honestly! )I chose the one with cotton yarn in to get hooking. I have made three so far and I am planning to make more using this pattern from this great site called Craft Passion. You know, the more mandalas I see, the more I might get 'hooked' in, it's just I always have things I really NEED to use on my making list. Can you believe it but it is Wednesday and I don't have a pile of WIP's to show you. Instead, I am on the cusp of starting lots of new things....exciting. Today I had crochet lessons with my beginners. We made fruit cosies to practise working in a round, stitch counting, remembering how to change colour and following a pattern rather than a photo tutorial. The link is here on ravelry. The pattern is in US terms but I just scribbled the UK ones over the top. They are great for children's school bags, grown up work handbags and make excellent teacher presents for the end of term. I simply would not send my girl to school with a nectarine thrashing about in her school bag without one of these, her friends think they are cool too! I made a skirt for Big Sis at the start of the Easter Holidays but the truth be told - the one I made for her was massive because I did not realise when you measure your waist for a ribbing waistband you need to reduce it by about 80% because of the stretch so the one I made her, fits me! It is really comfortable and if it was in a more adult fabric pattern and colour I would wear it myself with leggings but it looks a little childish on me. I have put it in the sewing bag for Amelia (aged 13) as something to aspire to, wear or try and make herself. It is a great way to knock up a quick comfy skirt. 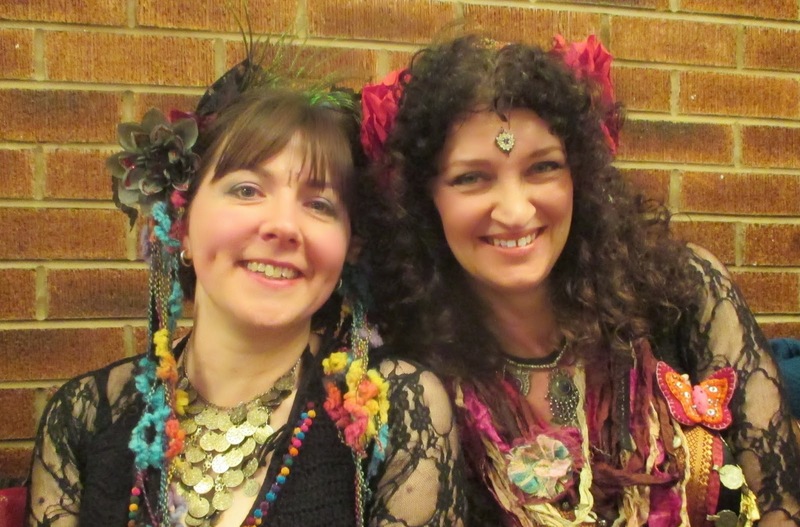 Last Saturday night I drove an hour to Wrexham to belly dance with the Severn Sisters, the tribal belly dance group I dance with. Here we are all dressed up trying not to be nervous by distracting ourselves with a quiz. It is just dressing up for grown ups really! I have loved the miette cardigan for a long time on ravelry and recently I saw one on a wonderful blog I follow called Handmade by Carolyn. It reminded me I wanted to zoom it to the top of my wish list. So I bought this yarn without checking the pattern properly. Twilleys freedom DK Echo from Black sheep wool. A really soft cotton with eco-credentials 100% recycled cotton. But the pattern called for aran weight. I knit up the tension square so many times on different needles but couldn't get anywhere near the gauge with the right texture. The yarn is great for this because it does not have much shaping in the body and the yarn has absolutely no give, it is like soft cotton string so it is ideal for a draping garment. So what about the miette you may wonder? Well mum and I were in hobbycraft on Thursday and we saw this Rowan yarn on sale and in the 3 for 2 offers with brilliant yardage (200m per ball). I chose this teal/petrol colour and I convinced my mum to have the last four balls of purple. We spent £24, wait for it.....altogether, our cardigans will be £12 each! We are going to do a knit-a-long together to pick each others brains as we go. As I went back to the car she shouted, "Don't start without me!"